Full of Sith: Episode XCII is another cross-over style episode, this time featuring the hosts of the ForceCast, Eric, Erik and Justin. They talk about their introductions to Star Wars, how they got started on the ForceCast, and some discussion on the trailer and the Mace Windu rumors. Episode XCIII kicks off with a full on discussion of the newly released trailer for The Force Awakens. Mike, Bryan, Bobby and Amy share their favorite moments from the trailer without taking up an hour of time. Instead, the rest of the show focuses on Star Wars Tours. They talk about the old version of the ride, the new incarnation, what the ride is like, and they even get into a Disneyland discussion about Disney jail and Tom Sawyer island. Really fun episode and definitely worth a slot on your playlist. Now Playing Podcast: to broaden my horizons a bit (and mostly because I enjoyed Star Wars Action News’ cross-over cast for Plastic Galaxy), I decided to try out a few episodes of Now Playing Podcast. Fair warning, if you see a short show, it’s because it’s a teaser for one of their fundraising episodes. Sometimes they’ll do exclusive shows only available to those who donate and they’ll release a short teaser of the full show for everyone to check out. I’d recommend skipping those as it’ll just aggravate you that you can’t listen to the full show. Picking some movies I like at random, I tried their Halloween, Predator, The Lost Boys and Terminator shows. Each is a full discussion with a three host format breaking down the main scenes of the movie, providing a little bit of film trivia, and sharing their thoughts on the film, the actors, the director and the music. I don’t mind, but for those that do, they do use profanity. Overall, it’s kind of entertaining, but I’m not sure if I’ll check out more or not. Rather than trying to fool anyone today, we thought it would be more fun to be foolish. So in our endeavor of foolery, we present to you The EwokKast. Now some of you might not think there’s anything foolish about our little furry friends on the forest moon of Endor. We agree: Ewoks are serious business. But when the topic is the first Star Wars spinoff movie, well, things get pretty foolish. Thus we present a 35 minute audio presentation of Caravan of Courage. Enjoy! Click “Save Link As” to download audio file. Don’t underestimate the Ewoks…unless you’re Rambo. What happens when Ewoks get involved with Duloks, Stormtroopers, Nightsisters and mythical monsters? You get Ewoks: Shadows of Endor, a fun and colorful take on the Ewoks that fans of all ages can enjoy. Click here to read our full review. 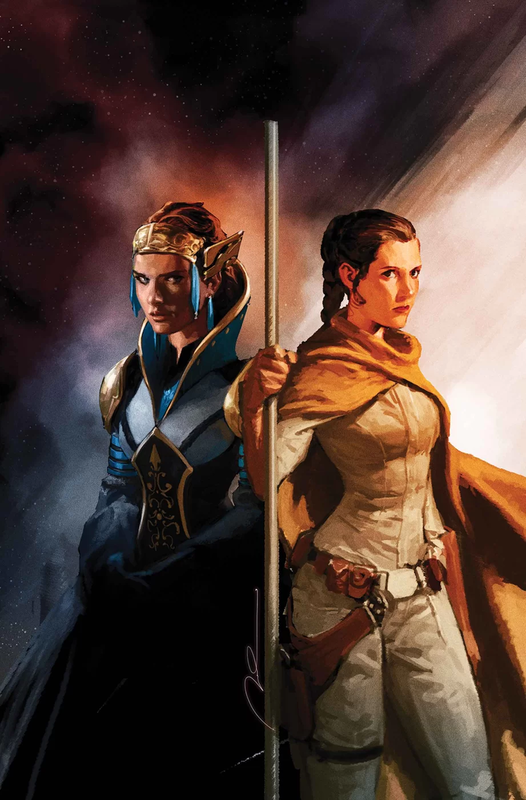 Dark Horse Comics has three new Star Wars releases today. First off is Star Wars #10 featuring another cover by Hugh Fleming and the return of interior artist Carlos D’Anda. Then there is the omnibus Wild Space Volume 2 and the brand new Ewok comic by Zack Giallongo, Ewoks: Shadows of Endor. * A look at the lighter side of the Force! Click here for a ten page preview. Until now, the Ewoks had been able to ignore the arrival of the Empire’s stormtroopers on Endor. But when they discover their rivals, the Duloks, have been enslaved and a legendary beast has been awakened, the Ewoks realize they may have to prepare for war—as soon as they figure out how to survive the beast! * Leads directly into the events of Return of the Jedi! * Ties into the beloved Ewoks TV series and movies! Click here for an eight page preview. Here at Roqoo Depot, we are counting down the days to the release of Ewoks: Shadows of Endor. Written and drawn by Zack Giallongo with colors by Braden Lamb, this trade paperback comic leads directly in the events of Return of the Jedi and ties into the Ewoks television movies and series. To help get readers in the mood, we’ll be doing an Ewok of the day each day until the comic’s release. 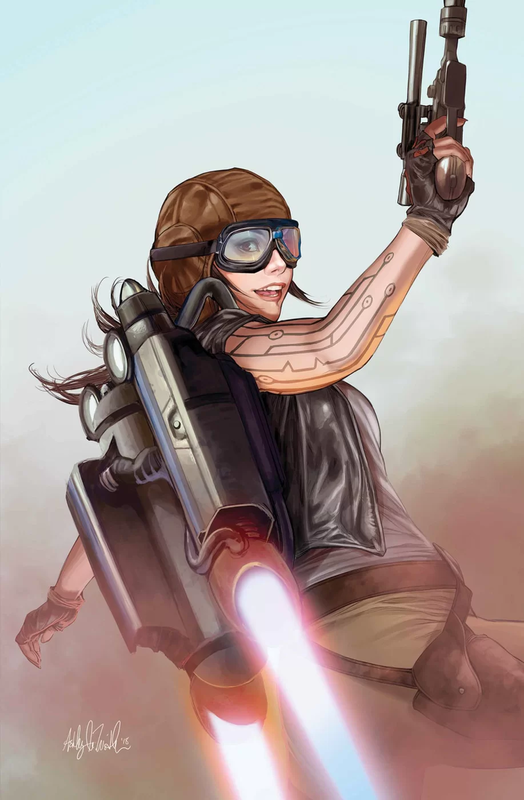 Today we’re highlighting Logray. Master Logray is the head shaman of Bright Tree Village. As far as Ewoks go, he has quite an adventurous life. Early in his life, he was enslaved by Tulgah witch named Morag who he learned Force magic from before escaping. His use of the Force enabled him to become a powerful member of his tribe, and someone Chief Chirpa depended on. However, like the Jedi, he experienced issues with training apprentices. His first apprentice, Zarrak, delved into dark magic and had to be banished from the village. Thankfully Teebo turned out to be a much better apprentice, and learned much from Master Logray. After the Battle of Yavin, he actually traveled to Naboo to visit the city of Theed along with Chief Chirpa. Sadly, Master Logray fell to the dark side as he began using dark rituals. It was his decision to sacrifice Han Solo, Luke Skywalker, Chewbacca and R2-D2. He was eventually ousted by Chief Chirpa and replaced by Paploo. In retaliation, Logray placed a curse on the village and went into exile. His name was sticken from the Songs of Remembrance and it became taboo to even speak it. Master Logray appeared in Return of the Jedi and the television movie Caravan of Courage: An Ewok Adventure. he also appeared in the Ewoks comics, Return of the Jedi 3: Mission to Endor, the Ewoks television show, and several children’s books: How the Ewoks Saved the Trees: An Old Ewok Legend, Wicket Finds a Way: An Ewok Adventure, The Adventures of Teebo: A Tale of Magic and Suspense, Fuzzy as an Ewok and The Ewoks Join the Fight. Ewoks: Shadows of Endor will be out on October 9, 2013.